The international best seller Human Resource Champions helped set the HR agenda for the 1990s and enabled HR professionals to become strategic partners in their organizations. But earning a seat at the executive table was only the beginning. Today's HR leaders must also bring substantial value to that table. 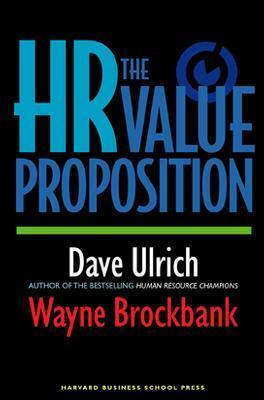 Drawing on their 16-year study of over 29,000 HR professionals and line managers, leading HR experts Dave Ulrich and Wayne Brockbank propose The HR Value Proposition. The authors argue that HR value creation requires a deep understanding of external business realities and how key stakeholders both inside and outside the company define value. Ulrich and Brockbank provide practical tools and worksheets for leveraging this knowledge to create HR practices, build organizational capabilities, design HR strategy, and marshal resources that create value for customers, investors, executives, and employees. Written by the field's premier trailblazers, this book charts the path HR professionals must take to help lead their organizations into the future. Ulrich is a professor at the University of Michigan School of Business and the author of 12 books and more than 100 articles on the subject of human resources. Brockbank is a clinical professor of business at the University of Michigan School of Business, the author of award-winning papers on HR strategy, and an adviser to top global organizations. The authors provide practical tools to build organizational capabilities, design HR strategy, and marshal resources that create value for customers, investors, executives, and employees. Dave Ulrich is a professor at the University of Michigan, School of Business and the author of twelve books and more than a hundred articles on the subject of human resources. Wayne Brockbank is a clinical professor of business at the University of Michigan, School of Business, the author of award-winning papers on HR strategy, and an adviser to top global organizations.